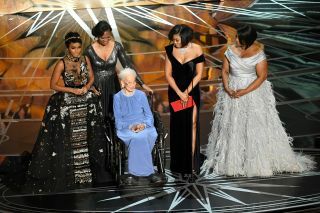 The stars of "Hidden Figures," the 20th Century Fox film about NASA's early African American mathematicians, took to the stage at the Academy Awards Sunday night (Feb. 26), not to accept an Oscar, but to pay homage to the real-life "human computer" Katherine Johnson, who received a standing ovation. "And then there are those films that shine the spotlight on those whose names are known to only a few, but whose stories are deserved to be told," added Octavia Spencer, who was nominated but did not win for Best Supporting Actress for her role as manager Dorothy Vaughan in "Hidden Figures." We were honored to be in an inspiring film about three such women," continued actress Taraji P. Henson, "whose brilliance made our nation's achievements in space possible." Henson then introduced Johnson, the mathematician she portrayed, as a "true NASA and American hero." "Thank you all," said Johnson, 98, after being escorted to the stage by NASA astronaut Yvonne Cagle. "Katherine Johnson on the Oscars!" tweeted NASA's Langley Research Center in Hampton, Virginia, where Johnson and her fellow women mathematicians supported the early Mercury spaceflights and where "Hidden Figures" is set. "What a wonderful moment." The segment was the space highlight of the night, which was few on awards for the nominated space-themed movies. Despite being the top grossing film nominated for Best Picture, "Hidden Figures" lost in all three categories for which it was a contender. In addition to Best Picture and Best Supporting Actress (for Spencer), "Hidden Figures" was also passed over for Best Adapted Screenplay. The movie was based on the book of the same title by author Margot Lee Shetterly. "Passengers," the Morten Tyldum-directed science fiction film about two people (Jennifer Lawrence and Chris Pratt) who are awoken early on an interstellar trip to an exoplanet, had been nominated for Best Production Design and Best Original Score, but like "Hidden Figures" did not win. "Arrival," the second highest-grossing Best Picture nominee, came away from the night having fared slightly better. The sci-fi film about Earth's first contact with an alien race was nominated for eight Oscars and won for Best Sound Editing (Sylvain Bellemare). Anousheh Ansari, who funded her own trip to the International Space Station in September 2006, and Firouz Naderi, the former director for solar system exploration at NASA's Jet Propulsion Laboratory, accepted the Academy Award for Best Foreign Language Film for "The Salesman," on behalf of Iranian director Asghar Farhadi, who did not attend in protest of the travel ban put into place by President Donald Trump. Ansari was the first Iranian and first Muslim woman in space. Former NASA scientist Firouz Naderi (left) and engineer/astronaut Anousheh Ansari pose with the Best Foreign Language Film award for 'The Salesman' on behalf of director Asghar Farhadi in the press room during the 89th Annual Academy Awards at Hollywood & Highland Center on Feb. 26, 2017 in Hollywood, California. Mahershala Ali, who portrayed Katherine Johnson's husband, Jim Johnson, in "Hidden Figures," won the Oscar for Best Supporting Actor for his performance as Juan in "Moonlight." Damien Chazelle, who won Best Director for "La La Land," will next helm Universal Studios' "First Man," based on historian James Hansen's biography of Apollo 11 commander Neil Armstrong.